How Do You Help Kids Get Ready the Evening Before School? If school hasn’t started yet for your school-aged charges it will this week or immediately after Labor Day. Last week we recommended getting ready for school the evening before. In FamilyFun Magazine a mother suggests that a great way to get a head start on making school lunches is making a variety of sandwiches beforehand and freezing them. 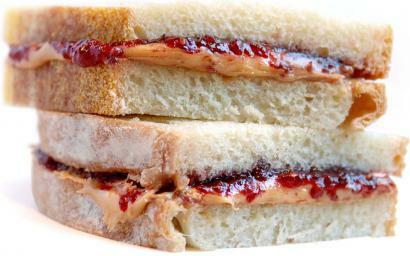 You can make peanut butter and jelly sandwiches and ham and cheese sandwiches (without condiments) and freeze them. Just pop the frozen sandwich into the lunch box (we love bento lunch boxes) with a packet of mayo or mustard if needed and by lunchtime the sandwiches are thawed and ready to eat. What other ways can you help students get ready for school the evening before? I also freeze capri suns and gogurt tubes before putting in lunch boxes. I do a lot of baking, like cookies, brownies, cupcakes, and muffins and then freeze them to put in lunch boxes. Plus grapes and squeeze yogurts. And sometimes puddings or fruit cups. We aren't allowed to bring cookies or candy or pudding type snacks to school anymore and they are no longer selling chocolate milk in schools here. They ask for nutritious foods only. I freeze the capri suns and squeeze yogurts too. Never froze sandwiches before. We pack the backpacks before I go home. We pick out their clothes, put lunches in the fridge before I go home too. Lay out their clothes the night before. Make a yummy lunch and include an encouraging note. Kids should go TO BED EARLY!!!! Wake up early so no rushing and stress. Their parents have the kids do as much as possible during their watch in the evening. Preparing meals with them, planning the clothes, packing the backpacks. We will switch out that I make sure baths or showers are done, so that they are able to have time together. This is a great tip, I never thought of something so simple. I feel like I'm scrambling to beat the bus with my daughter every morning so I will certainly add this to my bag of tricks to save time. Thanks for the information! Great idea, I will try it for sure!